FWP Matthews contacted Satake to investigate if a colour sorter could solve their problems. They already knew that several of their grain suppliers owned and operated Satake’s AlphaScan. The UK has experienced a sharp growth in the consumption of organic products in the past few years. FWP Matthews have focused their business towards producing the highest quality organic flours for a very wide distribution network. Their diverse customer base ranges from 25,000 kg bulk tanker loads to single bag orders received through their online shop. As demand for organic flour has grown, so has the capacity of the mill. Last year, FWP Matthews needed to further increase production. They faced the problem of not being able to clean the wheat efficiently and effectively at a rate that would keep up with their milling capacity. Incoming deliveries of organic wheat can suffer from additional and higher percentages of foreign seed inclusion due to the under-sown crop that is often planted with organic wheats to act as a soil fertiliser for next year’s harvest. FWP Matthews’s use of wheats from different countries also means that the type, size and characteristics of the foreign seeds can vary load by load. Sometimes this meant that they had to ‘double clean’ the wheat by passing it through their mechanical screenroom twice to ensure the required purity before milling. This double cleaning increases the loss of good wheat, energy usage and impacts on the production capacity of the mill. The introduction of new and additional mechanical cleaning equipment was first considered to solve the problem. However initial purchase costs, limited installation space, additional consumed power and potentially high running costs suggested that they should look for alternative solutions. Satake performed trials on a range of wheats from different origins at their test facilities in Manchester, UK. It was quickly concluded that the installation of an AlphaScan AS96R would meet the client’s demands for efficient cleaning at high capacity and in an environment with limited space. With no more than 1.5 kW of single phase power, a compressed air supply and general exhaust connection, the AlphaScan also offered huge power savings over the installation of traditional mechanical cleaning equipment with their larger motors, associated cyclones, filters and aspiration systems. 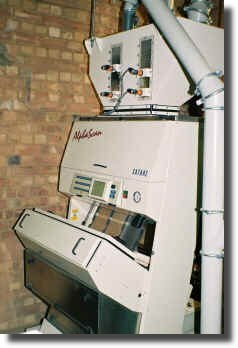 The Satake-ESM AlphaScan was installed at FWP Matthews in September 2006. The machine is located after a standard mechanical cleaning screenroom diagram. Wheat is processed at up to 6,000 kg per hour on the two primary chutes. Each chute has two visible wavelength front and rear viewing CCD cameras and 32 ejectors. The accepted product from the primary chutes continues in to the milling process. The rejected product is transferred by a simple blowing system to the third chute, where it is re-sorted separately to further concentrate the rejected material. All functions of the machine are controlled independently of the mill computer. The operation of the vibratory feeders based on product levels and flow rates, auto calibration and self-cleaning functions are all performed from within the software of the machine. This simplifies the installation as the only external control connections are interlock related. 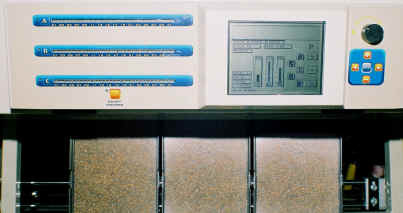 Satake-ESM’s AlphaScan range has been developed specifically for higher capacity sorting of cereals at lower cost. It has found favour with grain silo operators, durum millers, soft wheat millers, seed processors and producers of whole grain breakfast cereals.